Panko Pork Chops - Crusted! that Melt in your mouth. These Panko Pork Chops came as an afterthought when I came across a recipe for Crispy Chicken and thought why would the chicken recipe not work with pork? Well, after purchasing a large pork loin and having it cut into half inch pieces another Great Entree with only 20 minutes preparation time was created. Give it a try, you'll find it quite easy to prepare and cook and your family will enjoy this dish. 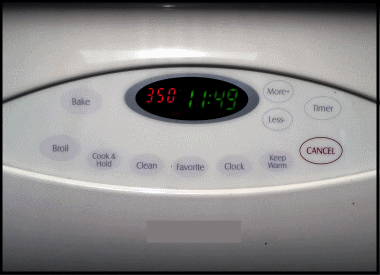 Turn on oven and set the temperature to 350 degrees to bake. Wash and trim pork chops leaving some fat. Place on a platter and keep moist. Crack open the egg and put in another bowl, then beat it with a fork to make it scrambled. In a medium bowl, mix the black pepper, garlic salt and flour until you see the black pepper as specs in a bowl of white flour. Place the bread crumbs in another medium bowl. Put the Garlic Infused Olive Oil in a 9 by 11-inch glass baking dish ensuring the oil spreads evenly on the bottom. Now I prefer to keep my hands clean as much as possible during the breading process, so the breading is done next to the sink where I can rinse my hands after each chop breading. Take a pork chop, rinse it under water then place in the flour coating all sides. Move the chop to the egg, dip it in and cover all sides. Move the chop again to the Panko Italian style bread crumbs and cover all sides then place in the baking dish. Rinse your hands if you wish. Repeat the steps again for each chop. 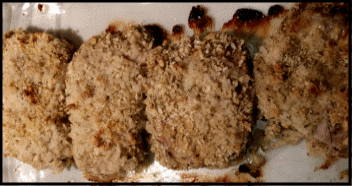 If you run out of bread crumbs, refill the bowl, but 1 cup should be enough for 4 pork chops. When all 4 chops are breaded and placed in the pan, the oven should be ready. Rinse your hands and dry them. Place the dish in the oven at 350 degrees as noted above and bake for 45 minutes. These Panko Pork Chops should be crispy on the outside and moist on the inside. Please note, ovens vary so check the chops at 45 minutes and make adjustments. While the pork industry has made advances in safety when the chops come out of the oven, take a meat thermometer and make sure the inside is at least 165 degrees or more. When I pulled these out after 45 minutes, the chops were between180 to 185 degrees internal heat and the meat was white, full of flavor and moist as could be. If you like your chops with more of a kick, add a half teaspoon more of pepper. If you want to add more heat and make them more South-western use a Cayenne pepper mixture, but use the Cayenne sparingly. Note1: The breading on the bottom of the chops will be moist, not crispy giving you all that rich roasted Garlic flavor. If you prefer chicken over pork, this recipe is over the top when it comes to chicken. However, you have to keep an eye on chicken breasts that are thinly sliced. Note2: A metal baking pan can be used with Aluminum Foil for easy cleanup. Make these two easy to prepare sides and make a complete meal. What others are saying about this recipe. Leave us a comment in the box below. 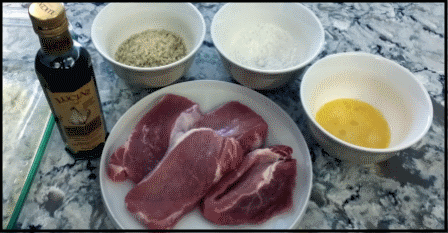 Return to Easy Everyday Cooking Recipes from Panko Pork Chops.